Happy Smoothie Monday, but today I don’t have a smoothie for you, but instead I have a thirst quenching drink to satisfy you when it is hot. Here in Northern California, it is extremely hot out. It’s in the 100’s and I can’t get cool. It’s crazy! We go from one extreme to another! That is why I made today’s recipe which is the Watermelon Refresher. This drink is just amazing! 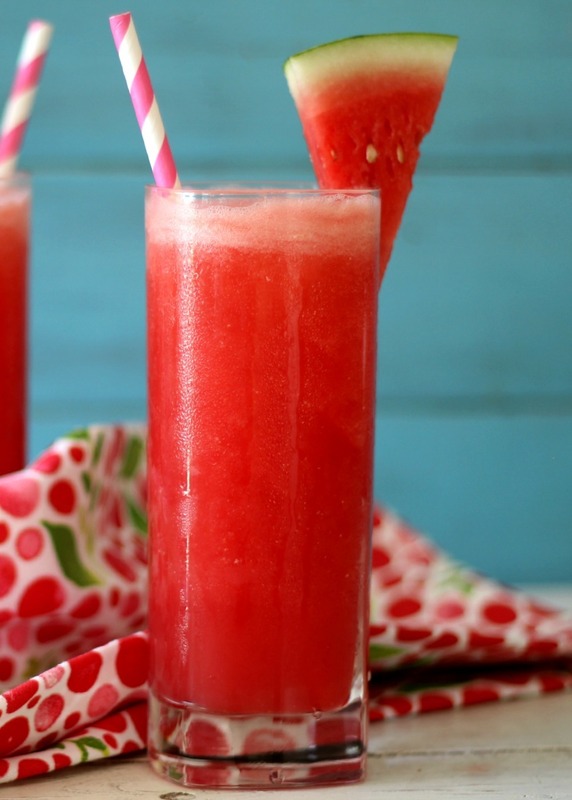 It tastes just like chilled watermelon with a little fizz. It is so good! I made it using fresh watermelon, a pinch of sugar, ice and sparking mineral water. It really does taste like your drinking watermelon. If your feeling a little naughty, I would think that a pinch of rum or tequila would really add some nice flavor, but I didn’t tell you that. I am loving this time of year with all of the fresh produce. Trader Joe’s has mini watermelons for $2.00. I couldn’t resist and boy are they sweet. Because the watermelon is so sweet, I only needed to add a teaspoon of sugar to the recipe! You have to love that. Plus this recipe makes two servings, one for you and one to share! I drank mine next to the poolside and pretended that I was some place tropical, like Hawaii. My dream destination! I’ll make it there one day! 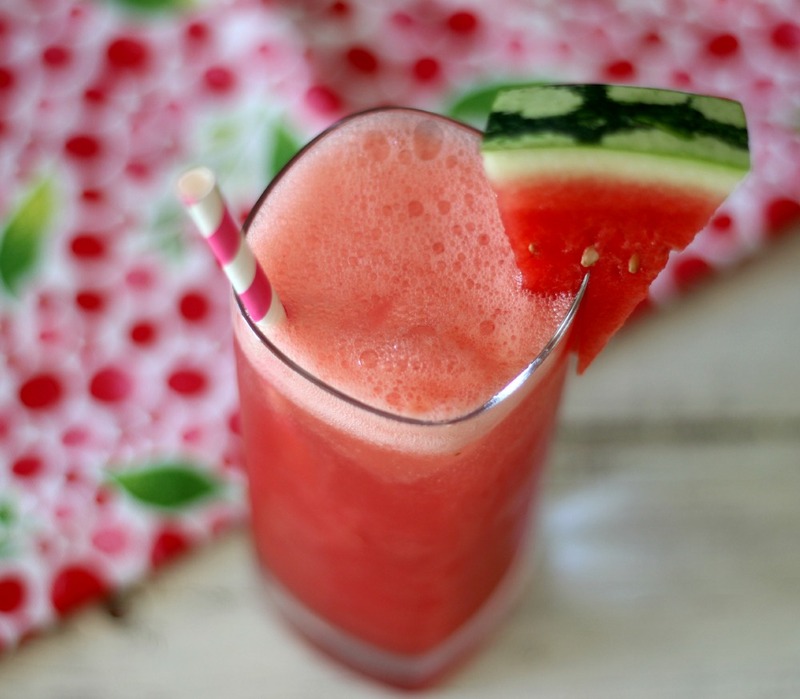 A light, refreshing summer drink made with fresh watermelon and sparking mineral water. 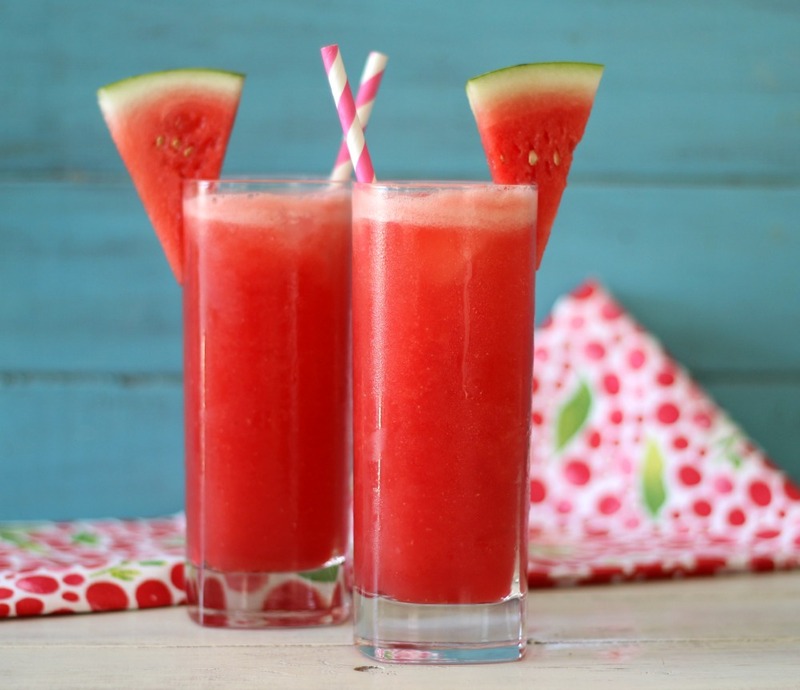 Add watermelon, ice cubes and sugar into a blender. Process until smooth. Pour into two glasses about ¾ of a cup full. top with sparkling mineral water or club soda. Garnish with a wedge of watermelon. So next time you’re looking for a nice light drink to quench your thirst, look to the Watermelon Refresher. It is simply a delicious drink and I will be making them all summer! Oh and you can freeze your watermelon for easy making in the future. Just dice it up and place in a freezer bag. I do that every year! 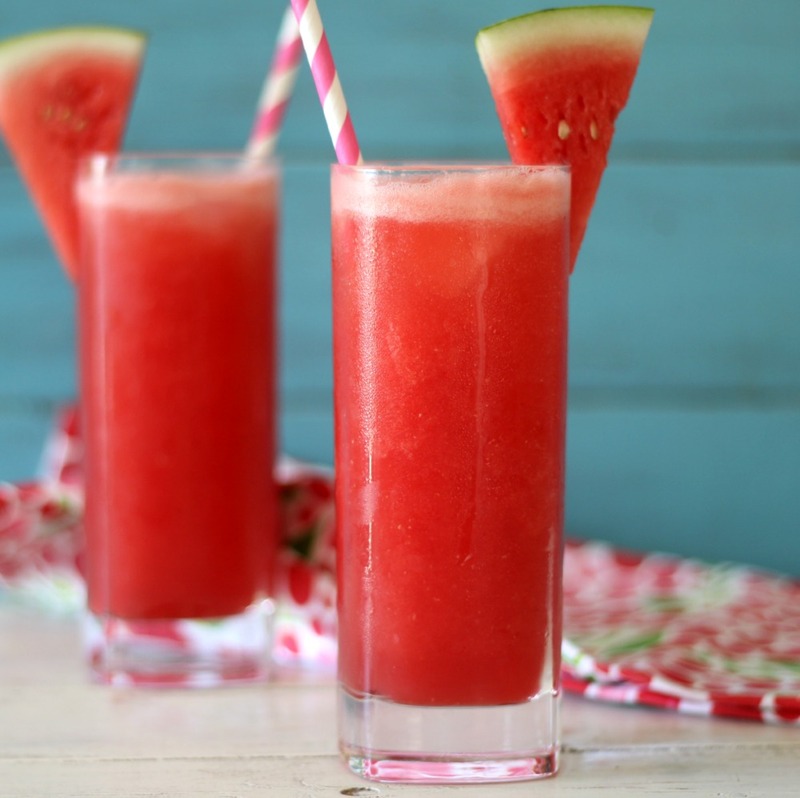 I am loving all of the fantastic watermelon recipes I am seeing lately! This is amazing! I am just loving watermelon this time of year! It is simply amazing! 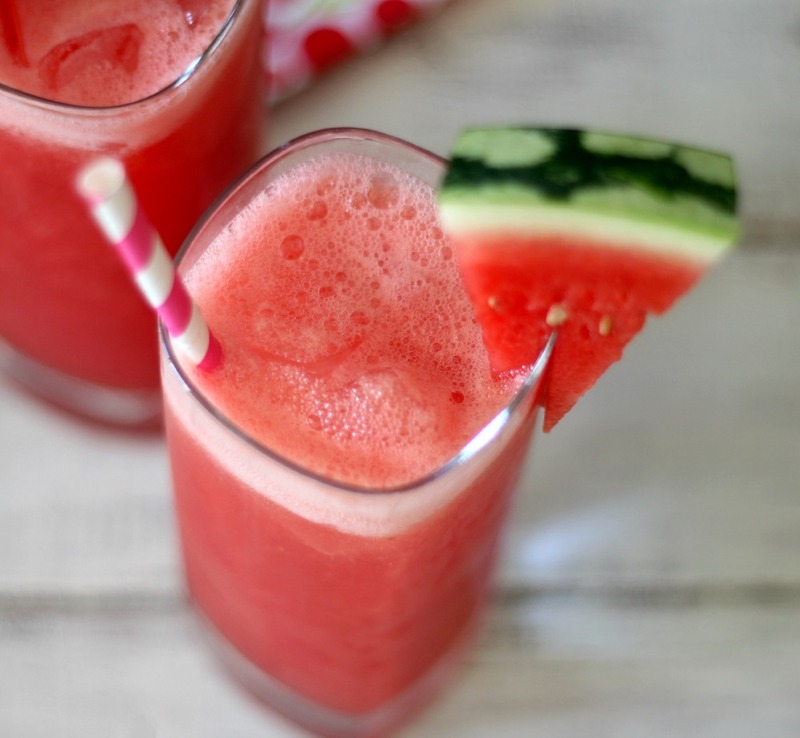 Watermelon is the most refreshing thing to have in the summer, especially in drink form! I made drink with watermelon and lime and coincidentally also called it a refresher LOL… (and uh, I put some rum in there, too…) Perfect summer cocktail! Love the idea of rum in it! 🙂 It is a perfect summer cocktail.